Belgian Callebaut chocolate, white chocolate natural lemon juice ganache, vanilla-butterscotch white chocolate ganache, tangy strawberry puree and cream-infused white chocolate ganache, and maple-walnut fondant. Charlie and the Chocolate Factory – Fantasy Becomes Reality! We at the Gourmet Chocolate of the Month Club are excited to bring back a small US confectioner who is known for creating fresh, handmade chocolates: Charlie’s Chocolates from Vista, California. Charlie is known for making old fashioned, hand dipped chocolates. Each one is handcrafted using the world's most popular and most flavorful Belgian Callebaut chocolate, known for its full, rich, aromatic flavor. The Belgian Callebaut chocolate is then blended to make the unique ganaches used in the variety of centers. All of the delectable centers are then hand dipped in more Belgian Callebaut and drenched completely before they are placed to set, allowing them to form small "feet" as they’re known in the business. Feet are naturally occurring skirt-like curves from the chocolate run-off at the base of each luscious confection. As true chocolate lovers know, feet are the ultimate sign of handmade quality chocolates. With Charlie's Chocolates, you will experience a number of delicious fillings, including fresh-cream-infused chocolate ganache centers. Look for the direct flavor of a single note in each piece, which is specially formulated with a slight liqueur-enhanced dark chocolate coating over a dark centered truffle. These are meant to satisfy the passion of dark-chocolate lovers. You will also savor white chocolate ganaches infused with cream and freshly prepared, intense, tangy fruit puree. The result is the most fragrantly flavorful fruit truffles imaginable, each with a thick coat of milk or dark chocolate. And then there are the multi-layered centers. Complementary ganaches are paired with each other in two-toned harmony. Others are paired with accenting layers of sweet fondant flavored with mint or vanilla-butterscotch. Another truffle has a layer of savory, aromatic caramel and nuts, topped with creamy ganache, finished with a sweet note of thin fondant, all surrounded by a coat of rich Belgian chocolate. For those who love caramel, there's the jumbo caramel turtle—a generous caramel patty with chopped nuts, hand layered underneath and covered with a broad swirl of thick chocolate that runs down the sides from the top with oozing caramel and nuts peeking out. Charlie's finely tuned recipes—together with his top-of-the-line gourmet ingredients and his artistry—create handcrafted gourmet chocolates we’re proud to feature. The dark-chocolate-coated dark ganache centered truffle is slightly enhanced by a blend of fine liqueurs to complement and round out the flavor of the chocolate. The dark-chocolate-coated milk chocolate mint truffle is made with a tall layer of milk chocolate mint ganache, over which a second thin layer of sweet white mint fondant is placed. One of the dark chocolates with white chocolate ganache is flavored with natural lemon juice (no doubt from Meyer lemons grown in the Vista area). One of the milk-chocolate-coated two-toned milk chocolate truffles has a center that is made of a half layer of lightly vanilla-butterscotch flavored white chocolate ganache combined with a half layer of milk chocolate ganache. 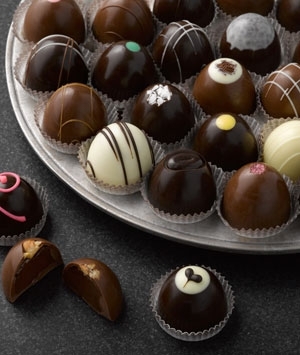 One of our favorites is the milk chocolate covered strawberry truffle. The center is made up of a fragrant, fresh strawberry puree and cream-infused white chocolate ganache that sits on a thin layer of specially prepared graham cracker crust. Yummy! Other milk chocolates are multi-layer candies with centers built with a layer of savory-sweet vanilla caramel and nuts, which is then layered with one or two kinds of chocolate ganache, and finished with a thin sweet layer of vanilla-butterscotch or maple-walnut fondant. Charlie suggests taking a knife and slicing these chocolates in half to see what you are eating. He wagers you’ll appreciate the chocolates even more. A tip for clean slicing: put a chocolate on a cutting board and take a chef's knife or a similar strong, sharp knife and slice down from the top. Here at the Gourmet Chocolate of the Month Club, we’ve had a delightful time getting to know Charlie and learning about how he carefully makes these culinary delicacies. Each of his handmade chocolates is made from the finest ingredients in order to achieve the ultimate in freshness and perfection. As delicious as they are, whenever we talk with Charlie about his confections, he says they’re still “a work in progress.” He reflects on and slightly revises his recipes constantly in an effort to make them even better: "As time goes on, the recipes for these candies are changed a little (for the sake of better satisfaction). It's usually just a minor change for more flavor impact— like its level of sweetness or the balance of richness and saltiness. Sometimes it’s a minor change in clarity or intensity.” Charlie says that he sometimes makes minor changes to improve the aesthetics so people will take a bit of extra time enjoying the product visually before diving in to consume them. Sometimes a minor change can tweak the taste of a chocolate, bringing out the most desirable flavor without going over the top. He explains, “It can be tricky trying to create perfection. I confess I'm always thinking about how to make the best better, even when I'm happy with something." 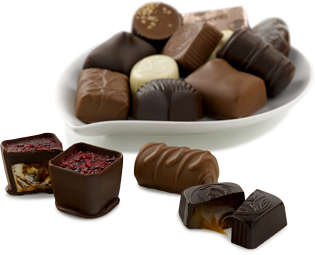 Like fine wines, chocolates should be stored in a cool, dry, dark area. Chocolate is highly susceptible to absorbing odors, so keep them away from other strongly fragrant foods. Optimally, you should store your chocolates at 59° to 65° F (15° to 18 °C), and under 65% humidity. However, if you keep them in an ambient temperature below 72°F and eat them within three weeks, there is no need to refrigerate your chocolates. And let's face it. How many of us are going to keep these chocolates more than a few days? In fact, unless you live alone, we recommend hiding them somewhere safe so that you get a chance to sample all the flavors!